PRESIDIANS PUT ON THE DIRECTORIAL CAP AT TECHNO FEST 2018! HomeNews and UpdatesPresidians put on the directorial cap at techno fest 2018! 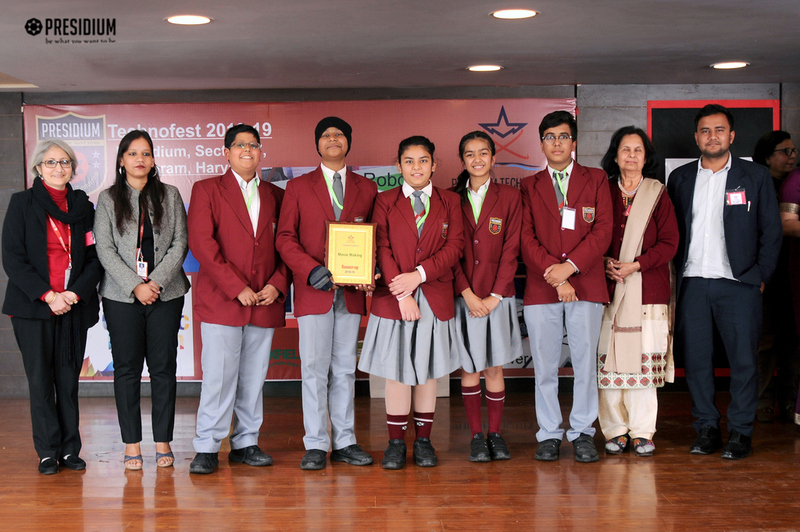 Students of grade 8 of Presidium Palam Vihar recently participated in the Technofest held at Presidium Gurgaon 57, where more than 10 schools participated with their teams. There were various categories in the competition such as Soccer Robot, Graphic Designing, Game Development, Paper Plane Making and Movie Making. Our students participated as team “Tech Force” in the category -Movie Making on the topic-‘Women Empowerment-Then & Now’. The students performed outstandingly and bagged the 2nd position in the competition. Mrs Sudha Gupta ,the Chairperson of Presidium was the chief guest. Ma’ama actively interacted with the participants and motivated students to expand their knowledge in technology as it is the need of the hour.